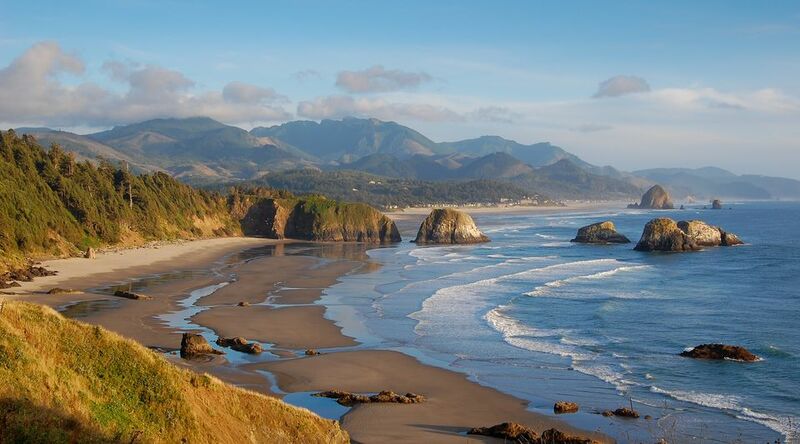 The Oregon Coast is a great place for a romantic getaway at any time of the year. Oceanfront suites, boutique hotels, and cozy B&Bs overlook rugged Oregon Coast beaches, which you can enjoy with your sweetheart on a walk or when snuggling by the fire. Oregon's coastal towns are small and charming, offering good food and unique shopping, as well as access to a broad range of outdoor recreation. Here are top recommendations for Oregon Coast hotels that are wonderful places for your romantic getaway. This charming New England-style inn is located in the popular Oregon Coast town of Cannon Beach. In addition to awesome ocean views and an intimate dining room, you and your sweetheart will enjoy a long list of amenities in your room. Flat-screen televisions, gas fireplaces, and Jacuzzi tubs are just some of the comforts you and your sweetie can enjoy together at this romantic Oregon Coast hotel. You can also enjoy complimentary newspapers and a breakfast buffet each morning. A number of special romance-themed packages are available. The Stephanie Inn is a winner of the AAA Oregon Four Diamond award. Tu Tu' Tun Lodge is the place for couples who love the outdoors. Guests can choose from sixteen different rooms, two suites, or two houses. The dining room features fresh local foods and overlooks the scenic Rogue River. The lodge is just seven miles from the ocean; with a river, forest, and coast access, you'll be able to enjoy a wide range of outdoor activities as part of your romantic Oregon Coast getaway. Tu Tu'Tun Lodge is in the town of Gold Beach in Southwest Oregon. 96550 N. Bank Rogue River Rd. Arch Cape Inn & Retreat offers old world charm and ocean views near Cannon Beach. Comfortably-elegant common areas and a picturesque garden make the Arch Cape Inn a wonderful place to relax and spend quality time with loved ones. In addition to scrumptious 3-course breakfasts, the Arch Cape Inn is well-regarded for its gourmet dinners. Highly recommended for a memorable romantic getaway. Situated below the Astoria-Megler Bridge and over the Columbia River, the Cannery Pier Hotel provides upscale modern accommodations while invoking Astoria's history as a commercial fishing village. Every room has a water view along with a sitting area, gas fireplace, and mini-fridge. During your stay at the Cannery Pier Hotel, you can take advantage of their on-site day spa, gift shop, Finnish sauna, history exhibits, and evening wine and hors-d'oeuvres. Guests can also enjoy complimentary breakfast, bicycles, and chauffeured evening transportation. The Sylvia Beach Hotel bills itself as "a hotel for book lovers." The rooms are named after such authors as Mark Twain, Dr. Seuss, and Robert Louis Stevenson. With no phones or televisions, this Oregon Coast hotel is a great place to enjoy a quiet and relaxing, yet romantic, getaway. Dinners in the award-winning Table of Contents Restaurant are served family style. The Sylvia Beach Hotel is located in the Oregon Coast town of Nye Beach, near Newport. The Ocean Lodge, a new hotel perched right on the beach, is located in Cannon Beach. Constructed to create the feeling of a 1940s beach resort, Ocean Lodge is perfectly situated to enjoy Haystack Rock views and to access local shops, galleries, and restaurants. Overlooking the mouth of the Columbia River in Astoria, this boutique hotel offers many elegant touches, including a wine bar and a cigar lounge. Pillowtop beds, heated bathroom floors, large TVs, and local artwork can be found in each room. Spa tubs and fireplaces are available in some suites. Breakfast baskets are delivered to you each morning. You and your sweetheart can relax and take in panoramic water views at Hotel Elliott's rooftop terrace. Many shops and restaurants are within walking distance; area attractions include the Astoria Riverwalk, the Columbia River Maritime Museum, the Astoria Column, and Fort Clatsop. Salishan Spa & Golf Resort offers a long list of activities and amenities. Couples can relax during a treatment at the full-service spa or play a round of golf at the Waterview course. You'll find indoor tennis courts, an extensive pool and fitness center, outdoor recreation facilities, a putting course, and a variety of shops and galleries. Salishan's upscale rooms come in a variety of sizes. Savor fine food and wine at The Dining Room or more casual meals at The Sun Room or the Clubhouse Grill. End your day with a cocktail at the Attic Lounge, where you can enjoy billiards and live music. Salishan Spa & Golf Resort is located in Gleneden Beach, just south of Lincoln City.